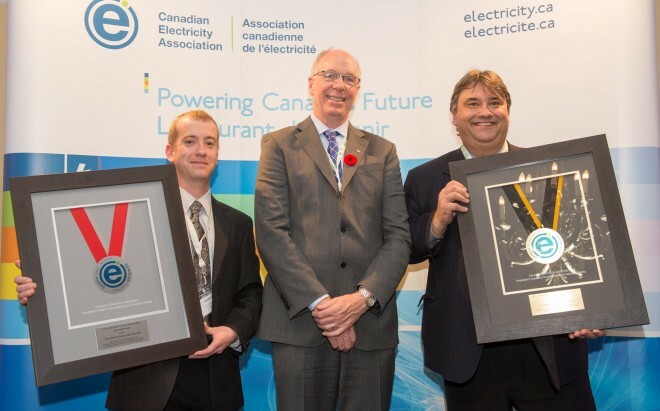 CASTLEGAR, BC – During an award ceremony held on Parliament Hill last week, Columbia Power Corporation received the Canadian Electricity Association (CEA) President’s Award of Excellence for Employee Safety and the Vice President’s Award of Safety Excellence for Generation. Columbia Power was the only company within Canada to receive the President’s Excellence for Employee Safety Gold Award which recognized Columbia Power for its top ranking in both All injury/Illness Frequency and Lost‐Time Severity rates for three consecutive years. The Vice President’s Safety Excellence Silver Award recognized Columbia Power’s safety record within its generation business for two consecutive years. The CEA is the national forum and voice of the evolving electricity business in Canada. The Association contributes to the regional, national and international success of its members through the delivery of quality value‐added services. This year’s awards ceremony recognized excellence in employee safety in the Canadian electricity sector and honoured CEA member performance. Columbia Power is a Crown corporation wholly owned and controlled by the Province of British Columbia. Columbia Power’s mandate is to manage assets and undertake power project investments as the agent of the Province. For more info about Columbia Power, please visit columbiapower.org.